I never lived in Bogart. I attended Watkinsville School and in the 40’s and 50’s they were fierce rivals in basketball. I attended many ball games in the old Bogart Gym –with people standing against the walls. Bogart has always held a fascination for me. My mother was living in Bogart when my parents married. Uncle DeWitt Daniell was a brother to my grandmother, Mama Hassie (Daniel Dawson). James Daniell (Coach) and Vance Daniell (killed in WW II) were first cousins to my father. 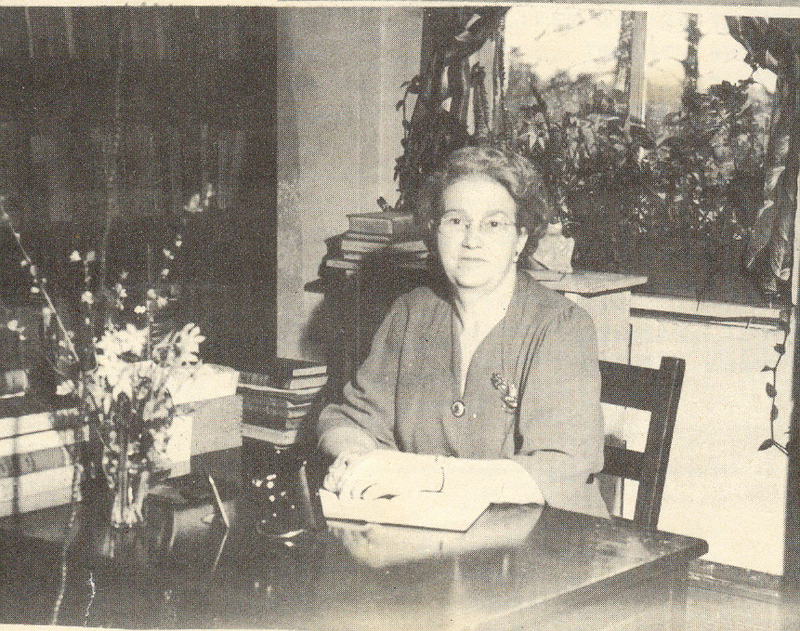 Aunt Ola Daniell, DeWitt’s wife, was Librarian. Martha Daniell was the daughter-in-law of Uncle DeWitt. I grew up hearing about “Preacher Hogan” at Bogart. I attended his church on occasion in my childhood. He was Superintendent of Oconee County Schools when I was in High School. He and I sat on his front porch when he was Mayor and I was running for office. I visited and dealt with him on numerous occasions during my terms as Oconee County Commission Chair. We started the Bogart Youth Recreation Complex and later the new library at the Park as a result of cooperation and help of B. C. Hogan. Preacher Hogan had three sons, Jack, Donald and Larry. 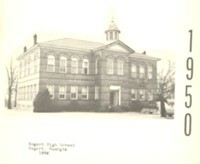 Jack graduated at Bogart before the two schools were consolidated. Donald was in the first senior class at OCHS on Mars Hill Road (OCHS Class of 57). I was in the first Junior Class (OCHS Class of 58) (along with my wife, Betty Pritchett and Donald’s wife, Frances Pritchett). Larry was in the first Sophomore class (OCHS Class of 59) and later played in the Dixie Redcoat Band at UGA. Donald and I have seen each other frequently over the years at Class and Family Reunions. I have had less contact with Larry. In recent years, Jack has become an email correspondent from his home in Tennessee. Joyce Williams Maddox, a fellow classmate of Jack’s (Bogart High of ’54) sent me this article and Jack consented to its publication. It captures the sense and nostalgia for the 50’s as experienced by many of us- Watkinsville Students too. It is a very poignant piece and we thank Jack Hogan for it. It's good to be here. Reunions like this cause us to reflect on our lives. It means renewing friendships, it means reminiscing, which I love to do, with a small group of classmates. Some of us worry about the fact that we've gained weight, or lost some hair, or can't see or hear as good as we use to, but once we're together, none of that seems to matter. There's a bonding that takes place because of our school experiences that generally last a lifetime. Even if the personal contacts don't last over the years, the memories do. Having said that, I would like to read a paper that is entitled Ghosts At The Old Bogart School. Some time ago, I strolled around the old school grounds, alone in the silence and inactivity ... thinking. It was difficult to realize that my last day at the Bogart School took place 50 years ago. Faces and activities started to appear in my memory. I thought, “There are a lot of ghosts around here.” These ghosts are not Halloween type ghosts, but “friendly ghosts" ... old friends of the past that I knew and loved ... and still miss. I could also see in that same building our second grade teacher, Mrs. Martha Colquit Daniell, standing by the door, greeting us as we came in each morning. When we misspelled a word, we had to copy it 25 times. If we used two or three pencils in the copying assignment, she would paddle our hands with a ruler. We had to bring to school each Monday a bar of soap and a towel to wash our hands before lunch. I could see the boys during recess drawing circles in the dirt to shoot marbles or spin-the-top ... while the girls were jumping rope or swinging. I could see us sitting in the wood folding chairs in the old gym for a class program and announcements. I could even see us filing out of the gym by the tune of “America” ... coming from the piano played by Mr. Tom Daniel. I could see the high school boys exercising on the softball field ... our government encouraged all high schools to do so because America was fighting for freedom in WW II. I could see myself in those grammar school days sitting behind the players bench watching the varsity basketball games that were coached by B.C. Hogan, games with Watkinsville, Statham, Winder, Monroe, Social Circle, Logansville, Winterville, Colbert, and others. 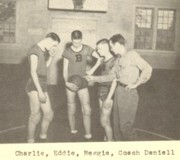 The 1943 team that Dad coached won the 10th District Tournament and played in the State Tournament. The team included players J.R. Boyd, Carl Brown, F.C. Carter, Jack Daniell, Vance Daniell, Jack Magness, Bill Nichols, and others. Vance Daniell gave his life for our country in World War II. Volunteering to go outside to dust the erasers, the oily floors, the coal burning stoves in each classroom, ( the time that Donny Norris and I were influenced by several senior boys to play with their homemade match shooters which resulted in setting on fire the sage grass on the school grounds ), and I could even hear the old school bell ringing between classes. I remembered the first time I saw Mr. James Daniell when we were in the seventh grade. He refereed our elementary basketball games. The next year, Mr. Daniel became a teacher and coach of basketball. The team’s record was 18 wins and 6 loses with players like Ray Bond, Eddie Salmon, Charlie Blackwell, Billy Huff, Bob Cash, Reginald Norris, Foster Pruitt, Ben McLeroy, Bill Mann, Bill Norris, Robert Downs, Jimmy Sims, and Tommy Michael. I could see us in the Agriculture and Home Economics building, sitting at the tables in Mr. Lamar Blackwell’s class ... reading the Farmers Magazine. There were the numerous tree leaves on the tables on which we were tested. Mr. Blackwell would write assignments on the blackboard and sign off by drawing a rabbit with a big cotton tail. In the middle of the cotton tail, he would write, “The End.” And, across the hall, the girls were in home economics making aprons, cooking, and once they even painted the walls. I smiled as I remembered the long belt line and initiation of all eighth grade boys and girls into FFA and FHA. 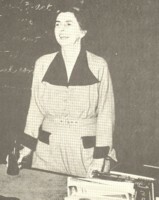 Perhaps the most valuable classes we took in our senior year were on the old Royal typewriters and the bookkeeping course taught by Mrs. Avis Hays. With the advancement of computers and technology today, little did we know at that time the true value of those classes. I could see all the bus trips and basketball games that enriched our lives. The 1954 girls basketball team, perhaps the best girls team ever assembled at Bogart High, composed of players Betty Thompson, Janet Zuber, Eloise Sims, Emily Dean, Shirley Dickens, Betty Bell, Mary Ann Downs, Eleanor Griffith, Mary Jean Smith, Betty Jones, Rebecca Whitehead, and Marinda McLeroy. That team won 30 games, losing only 3 games, and played in the final game of the state tournament in Macon. Then I remembered the Junior-Senior Prom in the old gym, decorated with bright ribbons and balloons, and tables with goodies. At the beginning of the program, we would write in five proms after which we walked down the dirt road past Mr. Dewitt Daniell’s house and back ... holding hands of course. I saw other teachers and classmates over the years that graced our presence. I could see those in our 1954 graduating class ... namely ... Joyce Williams, Betty Thompson, Janet Zuber, Rebecca Evans, Mary Ann Finch, Betty Parham, Annie Beth Payne, Donald Hammond, Loyce Boyd, Perry Michael, Sonny Thornton, Don Norris, Donald Dial, Glenn Downs, Vernon Jackson, David Michael, J.E. Walls, Troy Holliday, Earl Cox, and me. There are a lot of old friends in our memories who have walked and graced these grounds with their presence. Yes, their ghosts are still with us today ... they are friendly ghosts ... loving ghosts ... that we will never forget. We still remember and care about those who have gone on ... and by our presence today ... we continue to care for each other in the year 2004, our 50th anniversary. May we continue to build memories ... may we continue to enjoy reminiscing ... and may God continue to bless each of us. We don’t know what the future holds ... but we know who holds the future.